Yesterday marked our son's first real Trick'or'Treating experience and he had an absolute blast! 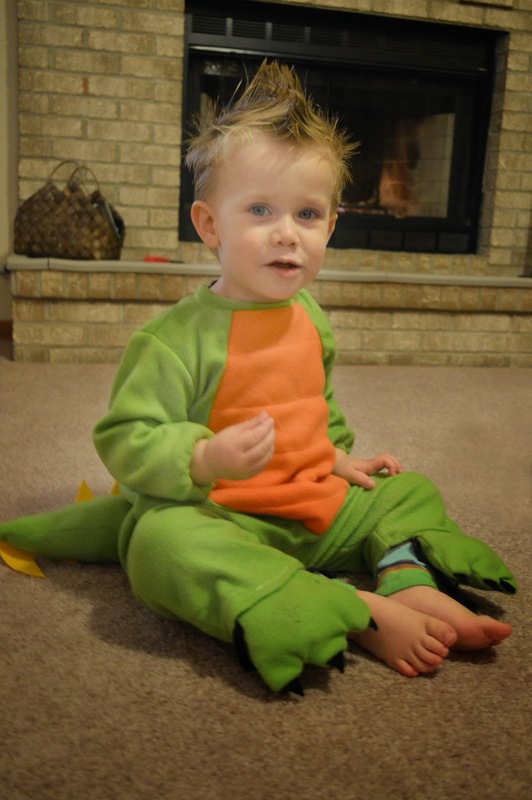 While there might be a small bias, I am pretty sure he was the cutest damn dinosaur to ever roam the land! Walking to the doors and taking the candy brought out the best of his shy side but once he had the candy, this little two year old gem of ours would say thank you and run down the drive way so he could do it all over again. While it was an extremely proud moment for my wife and I, we were (at least I was) slightly disgruntled at the lack of manners by other Trick'or'Treaters. What the hell happened to the day where kids would come to your door in their best costume, say "trick or treat", get some candy and say "thank you" like our little guy did? While I can't say that the overwhelming majority of kids didn't say thank you, an unacceptable amount of them did not. There was always that one or two that wouldn't but Halloween of 2013 proved to be closer to half of them not saying thanks after getting some candy. Are manners dead? Uncool, perhaps? Do parents not teach them anymore like my wife and I do? Our son is only two and we pretty much demand them from him. You want something...you say please. You get something...you say thank you. Shame on all of you little mannerless punks and shame on all of you parents who don't demand manners from your kids. Nick, sad to see for sure! Along with a number of other things going on with today's youth and their parents, this seems to be a "lost art". BTW, cute little Dragon there. Well the good news is that it seems that a lot of other people around me had a much better experience than me. Perhaps I just ran into a limited bunch of kids who forgot their manners. OMG - I totally agree. Don't even get me started because the lack of manners for not only children these days, but adults as well, is appalling. What happened to common courtesy? Your son is adorable and you should feel good that he is growing up with manners. Thanks, Kim! The adults are truly where the problem is and where most of my frustration should be aimed. Nick, you can't really be that surprised look at the way most adults act. The kids just mimic their parents. Good looking little dinosaur buddy. My theory is a lot of the kids are awkward with conversation because their parents are too busy ignoring them while using their smart phones and occupy them with tablets so they don't make too much noise.